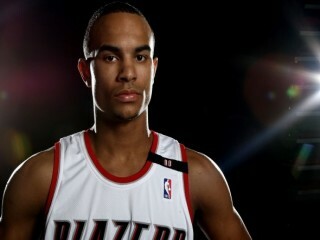 Birthplace : Phoenix, Arizona, U.S.
Jerryd Bayless is an American basketball player for the Toronto Raptors. He played a year of college basketball for the Arizona Wildcats after playing high school basketball at St. Mary's High School in Phoenix, where he scored a career high of 52 points in a loss to eventual state champions, Desert Mountain. He was selected 11th overall in the 2008 NBA Draft by the Indiana Pacers, and then traded to the Portland Trail Blazers along with Ike Diogu in exchange for the rights to Brandon Rush (13th pick), Jarrett Jack and Josh McRoberts. He was traded to the New Orleans Hornets for a first round pick on October 23, 2010, and to the Toronto Raptors on November 20, 2010. Originally selected by the Pacers in the first round (11th pick overall) of the 2008 NBA Draft. Acquired by Portland from the Indiana Pacers along with Ike Diogu for Jarrett Jack, Josh McRoberts, the draft rights to Brandon Rush and cash considerations on July 9, 2008..acquired from the Portland Trail Blazers in exchange for a conditional future first-round pick on October 23, 2010. Scored in double figures 29 times, including eight-straight appearances (1/20-2/3) for the first time in his career...made more free throws (201) than field goals (200)...appeared in 74 games, starting 11 times...dished a career-best nine assists 4/14 vs. GSW...netted a career-best 31 points (10-24 FG, 9-10 FT) to go with seven assists in his first career start 12/23 at SAS...his 31 points 12/23 at SAS set a new franchise record for points by a Trail Blazer in their first career start (30, Ron Brewer, Oct. 18, 2009)...scored a game-high 29 points (9-15 FG), including 16 in the decisive fourth quarter 12/17 vs. PHO. Averaged 19.7 points (led team, third in Pac-10), 2.7 rebounds, 4.0 assists (second on team, sixth in Pac-10), while shooting 45.8% from the field, 40.7% from long distance and 83.9% from the free throw line (led team, fourth in Pac-10)…garnered Second Team All-Pac-10 and All-Freshman honors…earned First Team All-District honors by NABC and USBWA…named Honorable Mention All-American by the Associated Press…was a Wooden Award finalist…became the first freshman to lead Arizona in scoring since Sean Elliot in 1985-86…became the first ever freshman to earn team MVP honors since Sean Elliot in 1986…scored 20-plus points 16 times and 30-plus four times…strung together a trio of consecutive 30-point games, becoming the first player in Arizona history to do so…tied the mark for most points ever by a freshman in a Pac-10 game, with a career-high 39 points (12-18 FG, 6-10 3-PT, 9-9 FT) 2/10 vs. Arizona State. Named to 2009 USA Basketball Men’s Select team, but an injury prevented him from participating…selected to 2008 USA Basketball Men’s Select team, playing alongside teammate LaMarcus Aldridge…notched a team second-best 18.0 points and 4.3 assists in four 2009 NBA Summer League contests (all starts)…named Most Valuable Player of the 2008 NBA Summer League, averaging 29.8 points in four games (all starts)…son of Denise Bowman and Brad Bayless...has one older brother, Justin…hobbies include golf and ping-pong, and has connected on two hole-in-ones…competed against fellow draft day acquisition Nicolas Batum and 2008 NBA Summer League teammate Petteri Koponen in the 2007 Nike Hoop Summit…appeared in “Gunnin’ for that #1 Spot” documentary…won gold medal in the 100 meters at the 9-or 10-year-old junior Olympics in Seattle…as a senior at St. Mary’s, was named to 2007 McDonald’s All-American Team, participated in 2007 Jordan Brand Classic, named to 2007 Nike Brand All-America team, was a Parade and EA Sports All-American in 2007…named Gatorade Arizona State Player of the Year his junior and senior seasons at St. Mary’s. View the full website biography of Jerryd Bayless.